What might be considered slightly intimidating to a first timer, is easily heaven on earth for a bibliophile. From the floor to the ceiling is a seemingly endless series of shelves crammed full of paperbacks, hardcovers, and everything in between. Immediately overcoming your sense of smell is the sweet stench of old books permeating the air like an invisible fog. Even though I've been there before, I still couldn't help but stop and marvel at the sheer magnitude of their collection when I walked through the door again for the first time in years. For someone who has never experienced the wonder of stepping inside one of the most amazing book stores in the country it is a little overwhelming, to say the least. While they do try their absolute best to keep the disheveled shelves as organized as they possibly can, it's still challenging to find your way around; much less decide on where you should start digging first. Most of the sections are separated by categories—in no particular order—with small signs labeling the corridors. If you ask me, I think that the clutter and confusion just add to the book shop's charm. 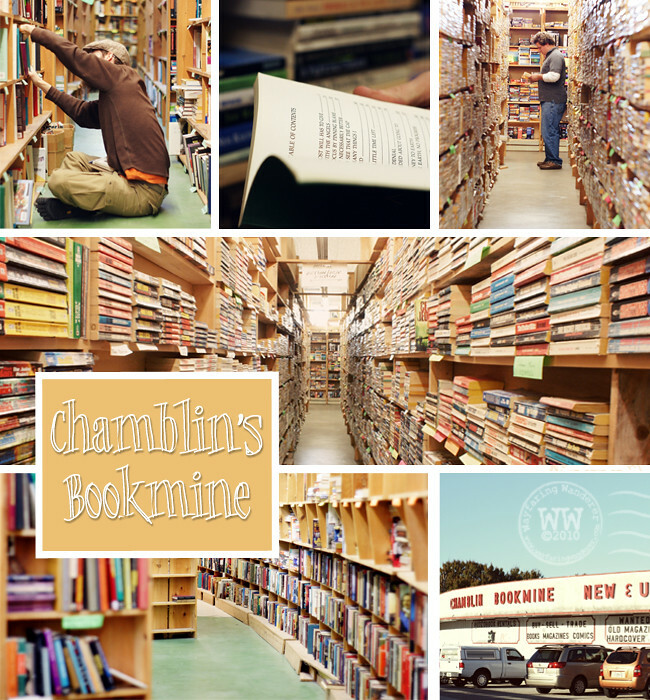 I'd much rather spend time aimlessly wandering through the isles of Chamblin's Book Mine if the alternative is some sterile-looking chain where real treasures are rarely unearthed. For me, it's a richer experience because you never know what you will find among the piles of pages. You can find books on any number of topics one could possibly be interested in. I wouldn't bank on finding a specific book, although you might get lucky. Even if you don't find exactly what you are looking for, you're bound to come across a title that will offer information on what you are in search of. 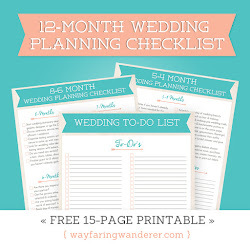 A better plan would be to go when you aren't really looking for anything in particular. However, it doesn't hurt to have certain categories in mind beforehand. I knew going in that I wanted to look for photography and graphic design related books. And I did end up leaving with a photography book, but the graphic design section didn't have anything that caught my eye. However, in my wandering, I did end up choosing a book on sketching and a few yoga related titles to take home as well. Over the years, Chamblin's has made some additions to the already overflowing bank of books, adding new alcoves and annexes. I was surprised to see how much more space was added since the last time I had been there (approx. 7 years ago). What started out as a miniature maze is now reminiscent of the movie Labyrinth—sans the scary little creatures. Luckily, directional arrows are placed throughout to help anyone who might have gone astray. Getting lost is the fun part, though. You can spend an entire day slowly sauntering through the towering stacks. Cody and I stayed for roughly 3½ hours sorting through book after book. Leaving with a pretty substantial pile, we both had about 6 books each. However, my bundle was significantly more expensive. He was hunting for older titles that cost no more than 2.95-4.00, whereas, I was in search of newer publications; they were only ½ off the cover price—still a pretty good deal, though. People have often complained that they don't have used book prices even though they still offer a discount. I think it's a small price to pay for such an amazing place. And since they buy books back with, basically, the same price structure as they charge, you can pretty much read what you buy and return it for credit on new books. It seems as though they want people to use it like a library almost. I really wish that this Jacksonville book store was a lot closer to where we are, or that we had a similar book shop we could visit without having to drive 8hrs to get there. I suppose we'll just have to make sure that we sort through our existing book collection and take a box with us when traveling back home for a visit. I'll definitely make sure that this beloved book shop will be a must stop on our trips back to Jacksonville from now on! A Side Note: since this place can eat up a number of hours, you're bound to leave with a hefty appetite. A few miles down the road is one of my favorite restaurants in Jacksonville, Fl, called The Loop pizza & grill. 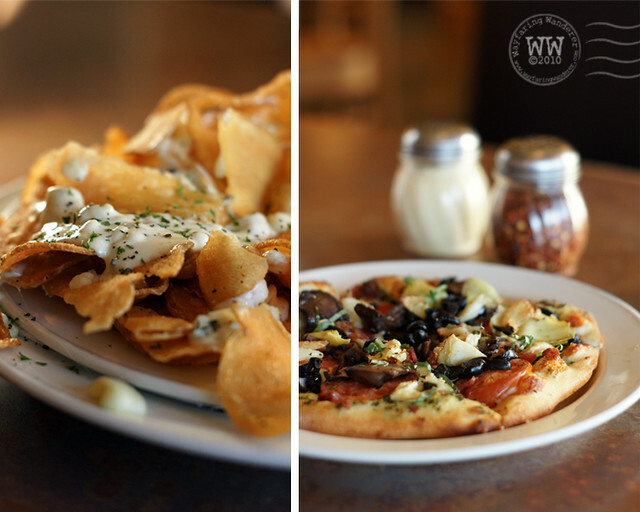 We ordered a smoked bacon and artichoke pizza and an order of homemade kettle chips topped with warm bleu cheese, both were unbelievably tasty. It's also right along the St. Johns River so you get a nice view to go along with the delicious food! It was a great way to end our day of pilfering. one of my 3 favorite bookshops ever! 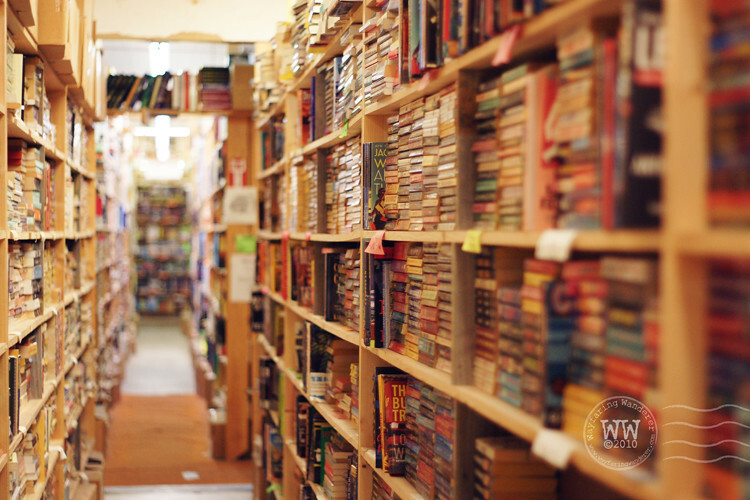 we have a store like that on a smaller scale here in montgomery (al) - it can be very overwhelming to explore there but she loves it when i come in with my used books. the place here gives credit for bringing in books to trade. this reminds me that i need to go visit. I adore bookstores of all kind. The smell is absolute heaven. And unfortunately in Chile there are not many. It's a dream of ours to open one up down here! Ooooh....what a find! You took such amazing photos showing a colourful perspective. A treasure. Thanks for sharing this blog. Its really good here is a good collection of books.